Phoenix Contact offers a wide range of robust and reliable technology. From HMIs (human-machine interfaces) and powerful industrial PCs to custom solutions for special industrial requirements. We will provide you with an impressive design, quality, and service package. Our HMIs and industrial PCs offer an attractive and outstanding product design. Compact and functional, they can be incorporated seamlessly into your system or machine design. Made by Phoenix Contact – you can rely on this promise of quality. Our focus is to provide durable components that meet industry standards and high quality requirements. From product selection to retrofitting existing systems, benefit from our comprehensive range of services. We also have a solution for your specific automation tasks. 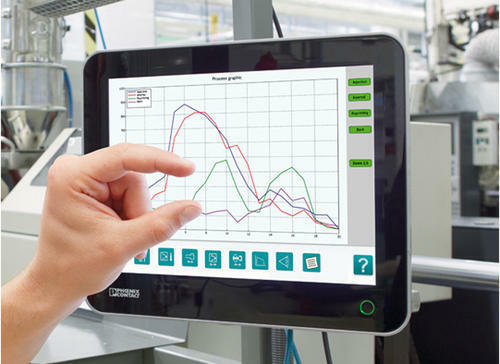 Choose the right device for your requirements: freely configurable industrial PCs or appropriate HMIs for the visualization software. Incepted in the year 2015, Automation Interface Solution is a distinguished enterprise instrumental in wholesaling, importing, exporting and trading of Smart Data Logger, SCADA Systems MIS Reporting Solutions, Ethernet Switch etc. In obedience with the progressions well-defined by the market, these delivered products are developed accordingly.